Calypso Cascades is an easy 3.6 mile hike to one of several waterfall destinations along this section of trail. 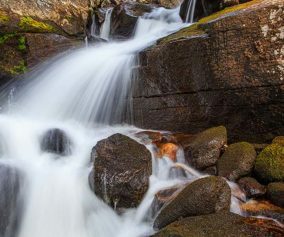 This waterfall in the Wild Basin of Rocky Mountain National Park is gets its name from the purple Calypso Orchids that bloom along the banks of Cony Creek. 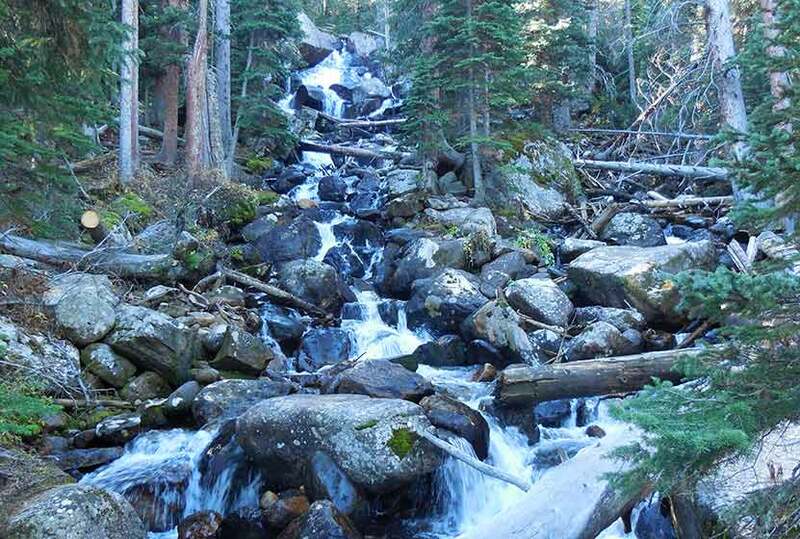 Explore the full Calypso Cascades hike profile below for trail map, driving directions, and more tips and details to help you enjoy this adventure in Rocky Mountain National Park. 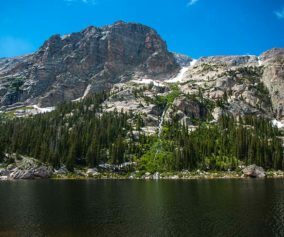 The southeast corner of Rocky Mountain National Park boasts one of the loveliest portions in the park known as the Wild Basin. 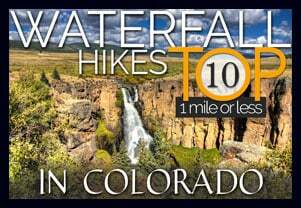 The Wild Basin Trailhead is located just 15 minutes outside of Allenspark, Colorado along Highway 115. There is a ranger station at at the Wild Basin Trailhead with toilets and drinking water available. In the winter (October-May), Hwy 115 may not be plowed to the trailhead, and hikers will need to park their vehicles at a winter parking lot for Wild Basin hikes. Be aware that hikes from the winter parking lot add on another 3 miles of hiking (one-way). There are other small parking areas, like the Finch Lake Trailhead, that may be accessible and allow hikers to park closer to the Wild Basin Trailhead. It’s important to know that Hwy 115, though titled a “highway”, is a maintained dirt road, which means that it can be used by 2WD vehicles. However, after heavy rains and other severe weather, its quality may degrade until it is repaired. 4WD may be needed when snow is on the ground. The hike to Calypso Cascades begins at the Wild Basin Trailhead, and at just .3 mile into the trail, passes by both the lower and upper leaps of Copeland Falls. Read our full trail profile on Copeland Falls for details on how to access both sets of cascades. 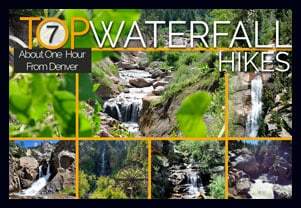 After taking in the views at Copeland Falls, the trail follows the course of North St. Vrain Creek as it flows out of the rugged high country and snowfields in this wild corner of Rocky Mountain National Park. Soon the trail will split. 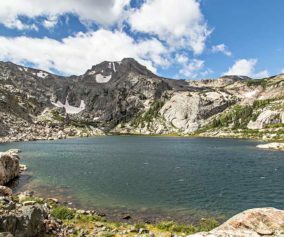 The right-hand trail leads through a segment of trail with 5 different backcountry camping sites and on towards Thunder and Lion lakes. These backcountry camping sites can be reserved through the RMNP Backcountry Offices. The left-hand trail leads south towards Calypso Cascades and Finch Lake Trail system. 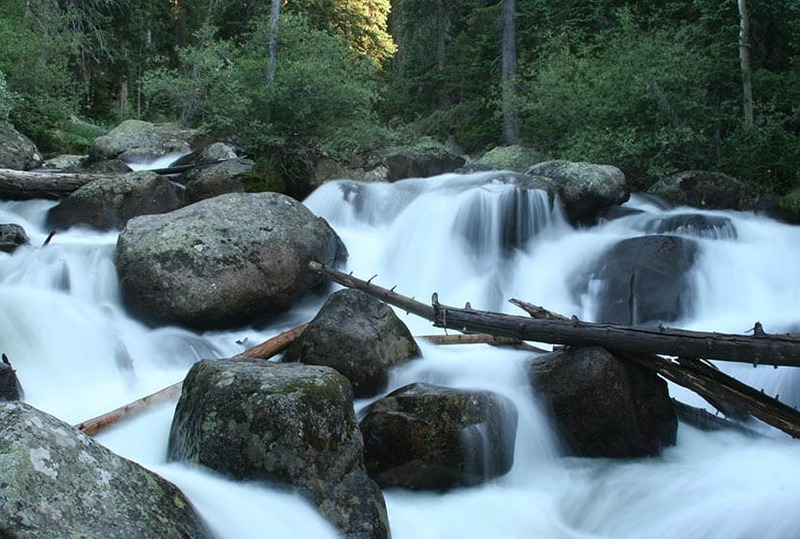 Taking the Finch Lake Trail, hikers will cross a large log bridge spanning North St. Vrain Creek. Near the bridge, you’ll discover an unnamed set of cascades. After crossing the bridge, the trail follows Cony Creek for about 0.4 mile to the site of Calypso Cascades. Calypso Cascades are reminiscent of Fern Falls: the waters of Cony Creek tumble over boulders and fallen trees in a moss-covered landscape. What makes Calypso Cascades unique are the Calypso Orchids (also known as Pink Lady Slippers) that bloom in the late-spring and early-summer along the creek. 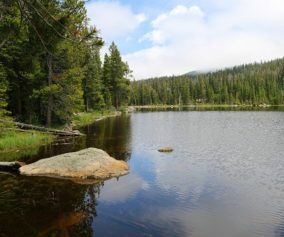 Hikers can return to the trailhead to make this a 3.6 mile hike, or can continue on the Finch Lake trail for approximately 1 mile to the site of Ouzel Falls. TIP: The area near the bridge over North St. Vrain Creek can be a great spot for a picnic. Packing List: Always pack the 10 Essentials. 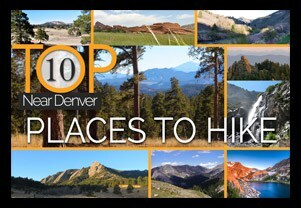 Download our Hiking Guide to get list and dayhiking packing checklist. TIP: There are food storage lockers available at the Wild Basin, Finch Lake, and Sandbeach Lake Trailheads. These are required for visitors staying overnight. Get there early: Parking lot might get full even early in the morning. You’re in Bear Country: Black Bears live in the Wild Basin area and are active on the months of April through November. Be aware, dispose of your food responsibly, and don’t food or anything else with a strong scent in your vehicle. Photo: We would like to express our gratitude to Jeff Kramer for sharing such an amazing photograph of this hike to Calypso Cascades in RMNP.